Safety first Mark Smith, construction and tree operations manager, Belknap Landscape Co., Gilford, N.H. There are many reasons landscape companies should focus on creating a culture of safety. The headlines above are just three of them. If avoiding one of those incidents isn’t enough to emphasize the importance of creating a safety culture, consider the law. The company’s Experience Modifier Rate (EMR), which can drive up insurance rates and also can affect the bidding process. Some clients won’t allow bids from customers with an EMR over 1. There’s no doubt that operating a safe workplace can be challenging for landscape companies, which are often small businesses with high employee turnover, running on a seasonal schedule. In fact, letting training fall by the wayside during the spring rush is one of the biggest mistakes landscape companies make when it comes to safety, says Sam Steel, Ed.D., safety adviser for the National Association of Landscape Professionals. Of course, running a safe firm is about more than just training. Safe Company Profile: Belknap Landscape Co. Learn more about this top safety company here. Steel fields many calls and emails from NALP members about how to improve their safety programs. He says he most commonly recommends that companies conduct regular safety training. If crews report directly to the worksite, crew leaders should be prepared to conduct training there. Steel also advises companies to assemble a safety committee, which is tasked with helping management put together safety materials. Committee members should come from all levels of the organization and include the field staff, he says. “They’re the ones who see the close calls every day,” he says. Steel recommends implementing a system where close calls or “near misses” are reported and used to develop future training efforts. Companies also should consider outside resources, like trade associations, regulatory agencies, insurance vendors and extension educators, to improve training efforts, Steel says. Identify and document hazards located at worksites. Use those site hazard assessments to develop written safety policies. These policies should be shared with employees during their orientation and at ongoing training programs. If training appears to be ineffective, consider changing it. Ensure all training sessions are documented with trainee and trainer names; training topics; and dates the trainings were conducted. Always provide policies, procedures and training in a language that workers can understand. Personal protective equipment (PPE) is an important safety topic. Consider that an initial 1910.132 PPE citation carries a fine of more than $12,900. “This amount can increase manyfold if the cited firm ignores or fails to abate the unsafe condition resulting in the citation,” says Sam Steel, safety adviser for the National Association of Landscape Professionals. So, who pays for it—the employer or the employee? It’s a question that comes up time and again on industry forums and at conferences. We asked Steel for guidance. When it comes to selecting PPE, Steel says the choice should be based on the company’s worksite hazard audits, where specific dangers like flying debris (eye wear required); excessive noise (hearing protection required); and respirable dusts (respiratory protection required) are identified. The following is a list of the top 10 most frequently cited standards following inspections of worksites by federal OSHA for fiscal year 2017. OSHA said it publishes this list to alert employers about these commonly cited standards, so they can take steps to find and fix recognized hazards addressed in these and other standards before OSHA shows up. 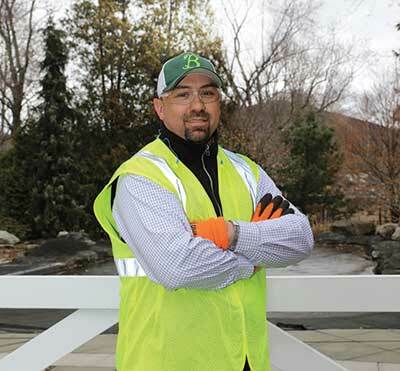 When it comes to workers’ compensation, there are three claim types that occur most frequently, according to Drew Garcia, landscape division leader for Rancho Mesa Insurance Services. He shares those here, along with steps landscape companies can take to prevent them. Why it’s happening: Workers take their gloves off because they’re getting in the way of the task at hand, such as pruning. How to prevent it: Find a glove that’s form fitting, provides protection and still allows the dexterity for workers to do their jobs correctly. A solution may be providing different gloves for different types of work. Why it’s happening: Strains occur from pulling or lifting. The two most common times for injuries are early in the morning and right after lunch when the body isn’t warmed up, Garcia says. How to prevent it: Implement a simple mobility stretch program in the mornings before crews begin their physically intense work for the day. Why it’s happening: Workers slip or fall on wet turf or uneven surfaces. How to prevent it: Garcia has seen companies create solutions such as avoiding slope work in the morning because of dew or designating a specific slope team that is aware of the hazards. For installation jobs, he says it’s important to identify hazards like uneven ground with a thorough walkthrough before the workday begins.